A really good friend of mine really loves Goyard. Really loves it. On a trip to Paris together, we went to visit the flagship of his beloved brand. As we strolled along the Rue Saint Honore, we discovered something better than Goyard.The brand we discovered is called Moynat. I say better, but perhaps that is not really fair of me. It is definitely much rarer than Goyard. Does that make it better? Perhaps for some it does. It did for me. I had never heard of Moynat and we would have walked on by had it not been for their beautiful facade. Above their door read “objet du voyage” and “maison fondee en 1849”. My oh my, how could this be? How have we not heard of this brand before? We just had to go in. It so happens that we had stepped inside to the storefront of the oldest luggage company in France. Not only is the business older than both Goyard and Louis Vuitton, but the founder was female! A female founder was a total rarity a century and a half ago. How cool is that? And why hadn’t we heard of them? The storefront that drew us in. 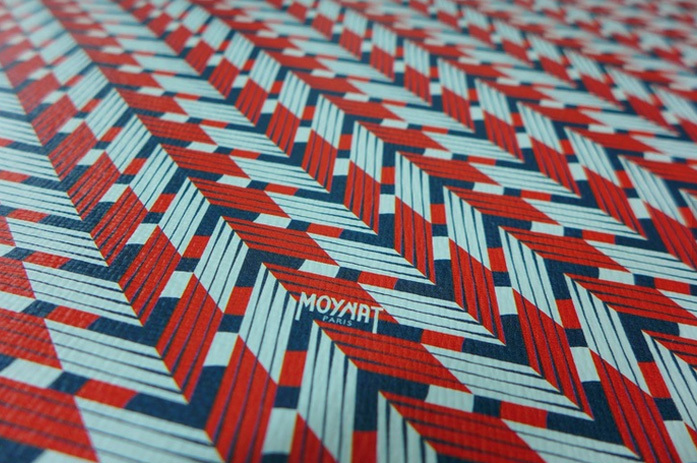 Oddly, Moynat is rather unknown despite its fascinating history. So let’s talk about their history. Pauline Moynat, a specialist in travel goods, partnered with trunk-makers Octavie and François Coulembier and opened the first Moynat store on Avenue de l’Opera. 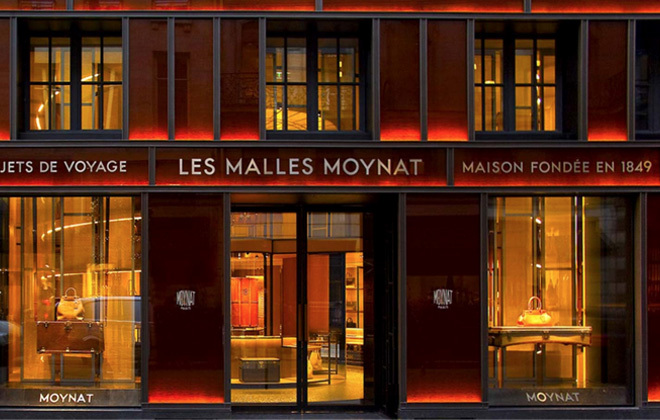 Moynat was one of the very first leather goods houses of its day. Known for its traditional know-how and skills rooted in handcrafting made to order luggage and travel goods, the house became famous for its designs for the automobile, as well as for its technical innovations such as making its trunks lighter and waterproof. 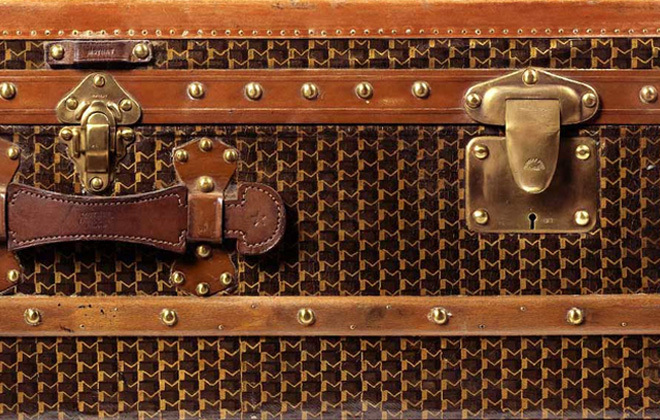 Moynat went on to become the premier trunk maker for the ruling elite who had to board ocean liners to cross continents. True innovators of their time, they were the first to introduce coated canvas as a medium as early as 1854. They did this by utilizing materials all the way from Indonesia. It is hard to imagine a time when trunks on ships and on the back of carriages weren’t waterproof, isn’t it? It is something we don’t even think about these days and yet Moynat created that technology. Moynat continued with that type of innovation. For example, in the age of the automobile, Moynat introduced trunks with curved bottoms to better fit cars. Moynat favored the color amber in particular. Derived from different tones of leather, this combination of orange with tawny brown was to become one of house’s most well known combinations. For more than 100 years, from 1869 to the mid-1970s, the company catered to the carriage trade from a shop just down the street at 1 Avenue de l’Opéra, offering trunks, hatboxes, fitted cases, and hand luggage, first for horse-drawn carraiges and trains, and later automobiles. 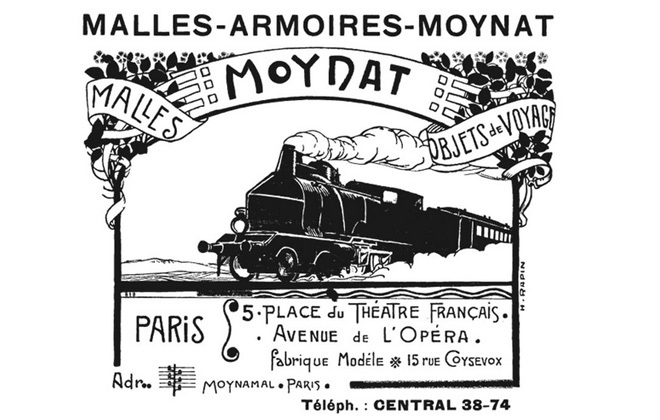 In 1976, Moynat closed its business. It was revived in 2010 by Bernard Arnault and he appointed Ramesh Nair as artistic director. It’s been almost five years since Moynat’s been revived. 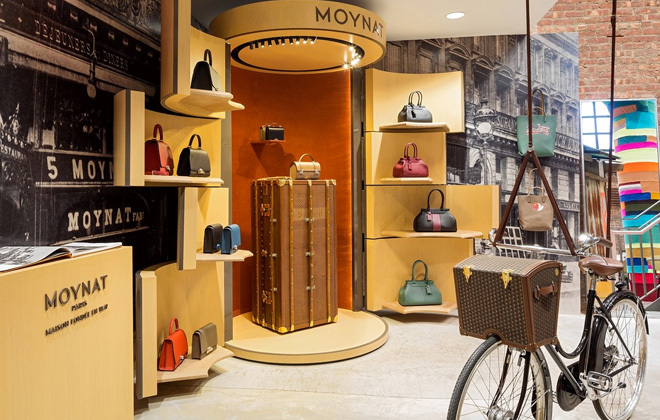 Although the brand has a long and rich history, Moynat had the challenge of reviving the tradition of their savoir faire because it had completely disappeared. Finding craftsmen was one of their biggest challenges. They were not able to find original craftsmen from Moynat, but they had the good fortune to meet with many people who knew craftsmen. They also met with trunk collectors and vintage car enthusiasts and began to rebuild the skilled teams previously associated with Moynat. 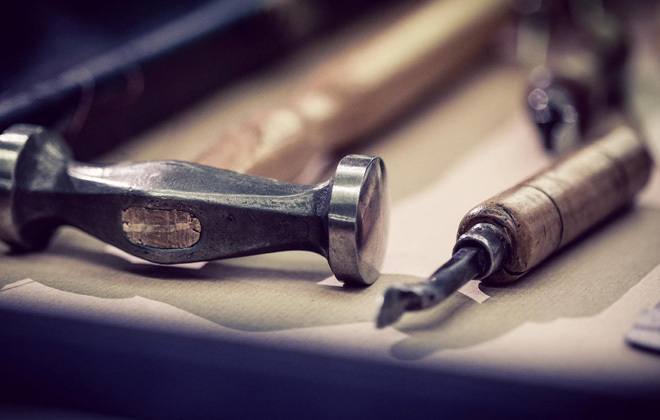 The craftsman’s tools of the trade are gorgeous in their own right. Talented artisans capable of making these kinds of bags are not easy to come by. Now let’s talk a little bit more about their uniquely skilled craftsmanship. 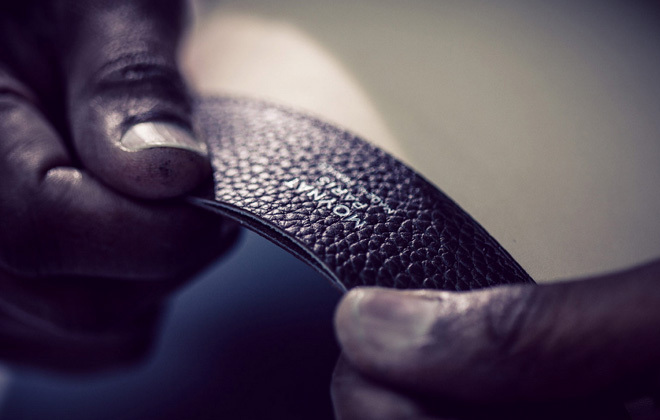 Moynat’s signature smooth-edge finishing requires an artisan to hand-polish the leather fibre before applying a layer of paint, a process that needs repeating seven or eight times. Nair works at the Parisian atelier with eight artisans, many of whom use tools that were inherited or which they invented themselves rather than relying on hi-tech machinery. The artisans spend many hours on Moynat’s bags by hand-stitching and hand-polishing every piece. 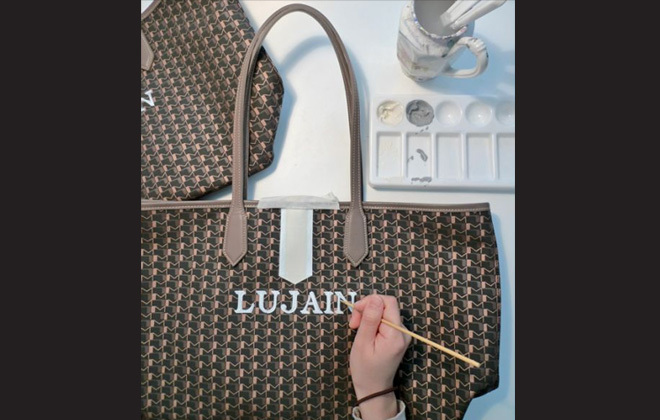 The artisans can be commissioned to create illustrations and hand-paint on handbags – with loads of personalised options. 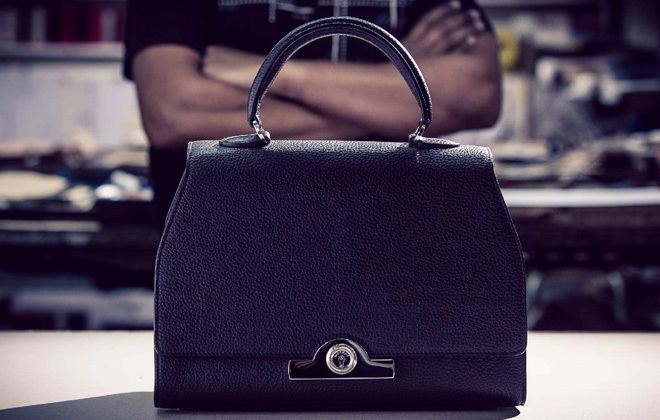 Customised styles can be specially ordered at Moynat and this takes three to four months. 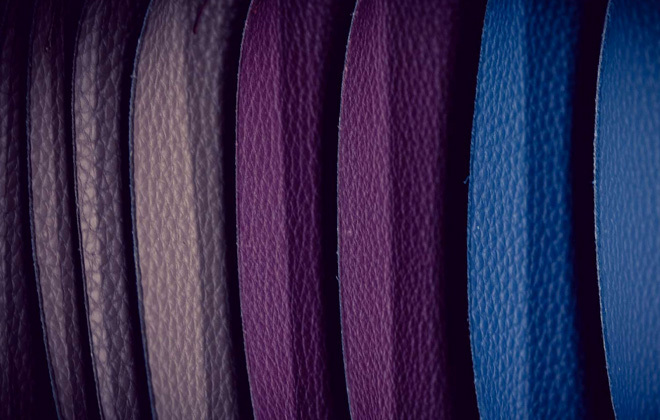 Just a small sample of the stunning range of colors to choose from. The finished piece that took hours and hours to make. Customisable options abound. This could make a lovely gift. A Moynat display from last year at Dover Street Market NYC. Today at Moynat, this amazing handful of employees and craftsman are quietly making leather goods and custom trunks that are coveted by those who seek special and true luxury pieces. Turns out, my friend was exactly that customer. It was a brand truly inspiring for the both of us to discover. Now my friend just has to wait quite a few months for his special piece to arrive, but good things come to those who wait.